A week spent in Paris and the Loire Valley makes me no expert to talk about French food on this blog (and no, living in NYC with amazing French restaurants do not count, because I do not visit them often), but if the Association of Maitres Cuisinier de France invites a Chef to be Maitre Cuisinier de France, then you know that the restaurant of the Chef is worth visiting. The Association’s motto is “to preserve and spread the French culinary arts, encourage training in cuisine, and assist professional development.” Chef Claude Godard is a Maitre Cuisinier de France (Master Chef of France) and Jeanne & Gaston is his latest restaurant that I had the pleasure of visiting when I was invited to a press dinner last week. At the end of the meal, I left feeling that Jeanne & Gaston is a (hidden gem of) a restaurant that I would go to celebrate a special event or perhaps even on a regular week night with someone special. 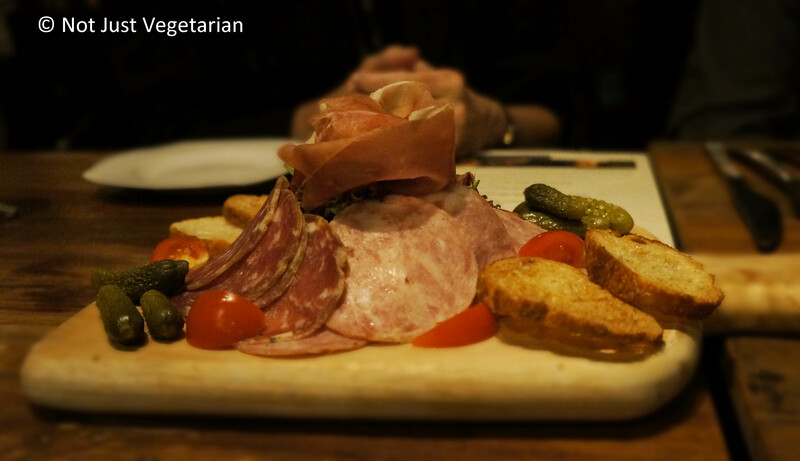 Jeanne & Gaston is a restaurant serving classic French dishes, many that have been updated with a modern flair. Chef Claude Godard also showcases a selection of specialty Burgundy dishes that are from family recipes. The restaurant is named after Chef (and owner) Claude Godard’s grandparents – Jeanne (grandmother) and Gaston (grandfather). 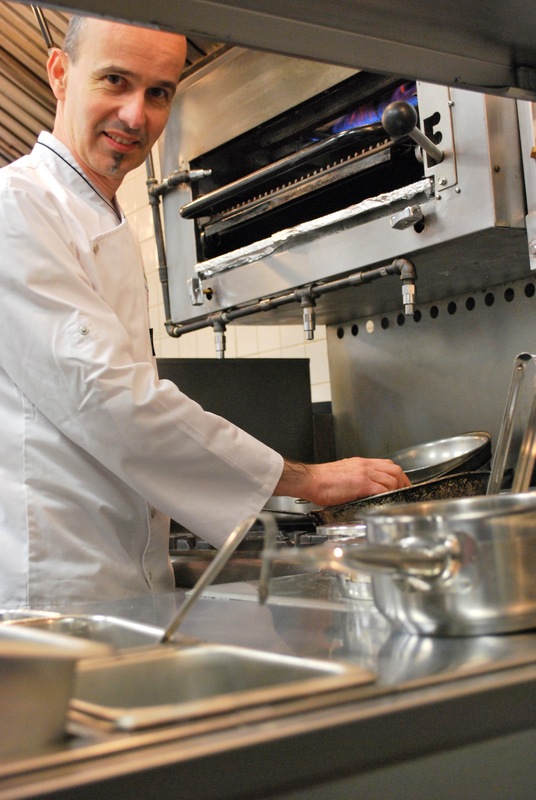 Chef Claude Godard has spent many years cooking in France with many renowned chefs, including in their Michelin rated family restaurant, Restaurant Godard. 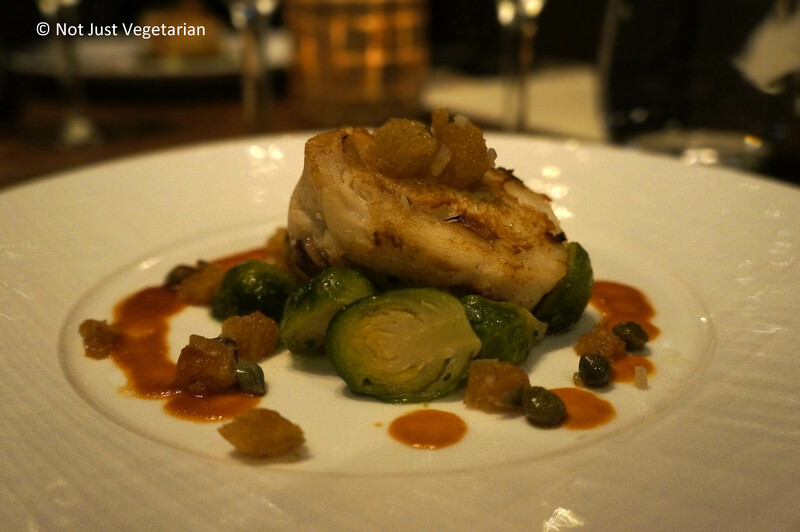 Chef Claude Godard also runs Madison Bistro in mid-town NYC that is popular for business lunches and has its loyal guests who like the classic French dishes served there. He is also the Executive Chef, Wine Director, and Pastry Chef at Jeanne & Gaston that has been open since December 2011. 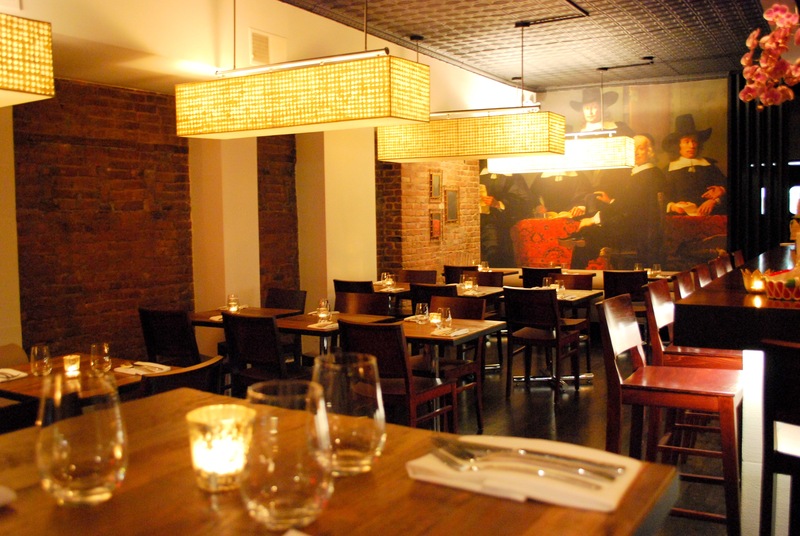 Jeanne & Gaston is tucked away between the borders of Union Square, Chelsea, and the Meatpacking district. 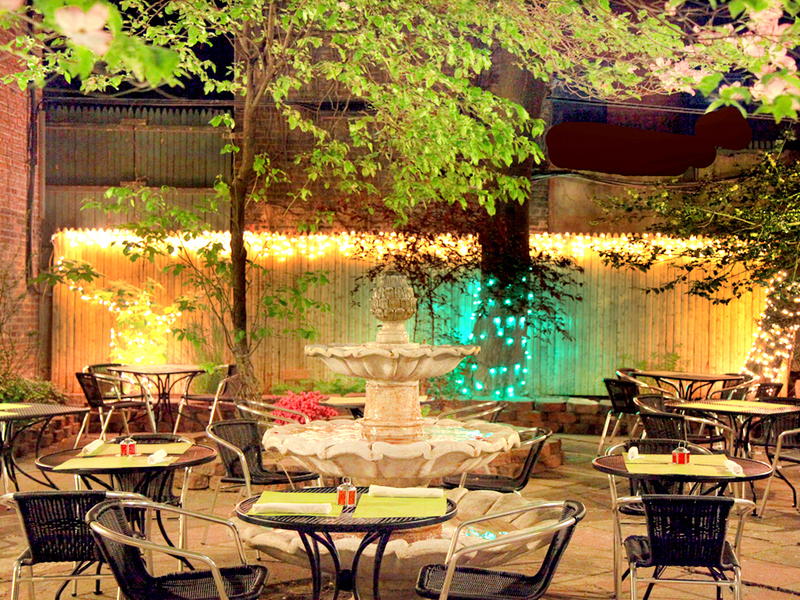 You will never know that it has a nice seasonal landscaped garden at the back of the restaurant. Happy hour is from 4 PM every day with select French wines starting at $6 a glass. The restaurant has live jazz on Thursday evenings. The wine selection for the evening was a Vouvray (demi sec) made from Chenin Blanc grapes at Chateau Montcontour. Chef Claude Godard was kind enough to share this wine from his private collection with us that evening. The wine was velvety in texture, fruity, and sweet – something that I like , and was popular at the table that evening. More about this wine here. This wine took me back to the few late Spring days that I spent in the Loire Valley… ah, bliss……!! Well, back to the food at Jeanne & Gaston. Charcuterie The charcuterie board arrived with cuts of rosette de lyon, garlic sausages, cornichons, and chicken liver mousse. The table favorite for the evening was the chicken liver mousse, which I did not get to try. 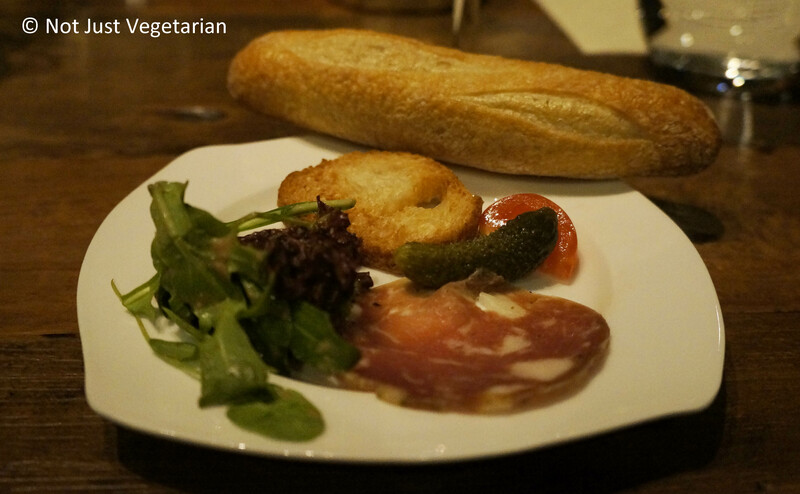 I loved the mini baguettes that arrived for the table. The server asked me what kind of wine I wanted to try, and I asked for a dry white wine. I was served a sauvignon blanc from Bordeaux (sorry, did not get the name). I liked it because it was light, crisp, and slightly acidic. Appetizer – Smoked Herring on Potato blinis with creme citron The smoked herring arrived on potato blinis and with a small dollop of whipped lemon cream (creme citron). This was my first time eating a smoked herring and I enjoyed it tremendously. The saltiness and the smokiness of the fish paired very well with the lemon cream and the potato blini that the fish was sitting on. I recommend this dish again at Jeanne & Gaston. 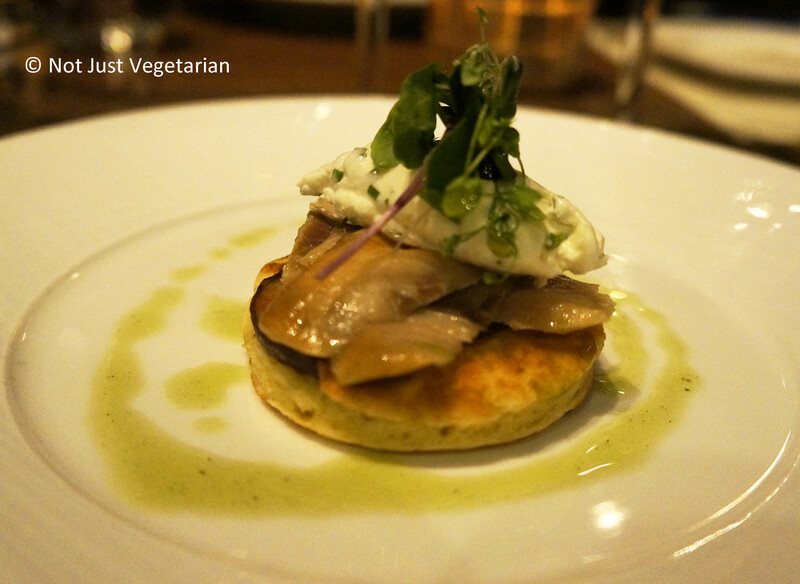 Somehow, I have always associated herrings and blinis as being Scandinavian / Russian in origin and I was told by the Chef that this dish is in fact a classic in Lyon. Further internet research reveals that smoked herring (Hareng Saur) is very common in the Upper Normandy region in France, and is often served with potatoes. More about smoked herring in France here. This NY Times article is about the increasing popularity of smoked herring in NYC restaurants over the past couple of years and educates one (especially me) about the herring’s role in different cuisines. Appetizer – Quiche “boudin noir” with sauteed apples, and leaves This quiche was very light because of phyllo pastry. The filling of sweet apples, cream and eggs, made it extremely light and fluffy. With the few leaves on top, its easy to miss spotting the “boudin noir”. When I saw this dish on the menu, I did not realize what “Boudin Noir” is and did not check on-line either, until the Chef mentioned that its blood sausage. I do not normally eat blood sausage, but I must also add that the blood sausage did not overwhelm the quiche with its intensity. I loved this quiche and ate everything but the blood sausage. Here is a link from Peter Hertzmann, on Boudin Noir where he writes that its often eaten grilled with a serving or apples and potatoes. Entree: Seared Skate wing The seared skate wing was served with a brussels fondue and croutons in spicy jus, and with capers. This was a delicious entree to say the least. The fish was flaky, yet extremely flavorful and not chewy or leathery. The capers added bursts of saltines, while the tiny croutons soaking in the spicy jus added wonderful texture along with the sweet Brussels sprouts. I recommend this dish at Jeanne & Gaston. Dessert Trio – Traditional Apple Charlotte, rum baba with pineapples, and ginger creme brulee The dessert trio arrived as small portions of traditional apple charlotte, rum baba with pineapple and chantilly cream, and ginger creme brulee. My favorite that evening was the apple charlotte. When I ate the Apple Charlotte, I thought about my ignorance of (French) food because I did not know what an apple charlotte meant. It tasted like an apple pie, but was different. I thought it was cake that the stewed / cooked apples were sitting in instead of pastry / pie. The outer layers were bread slices drenched in butter, and moulded in a small cake tin. According to this post, it’s unclear if the Apple Charlotte is French / English (or British?) / Polish. Will the origin make the dish any less delicious? Certainly not!! I would get this dish again. 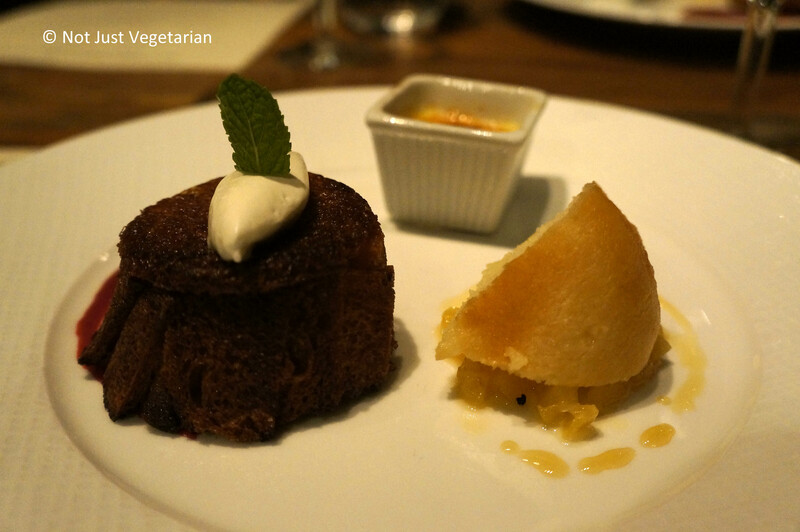 Rum baba is a small yeast cake soaking in rum and this was served with diced pineapple pieces. The ginger in the ginger creme brulee was a completely new flavor for me and it did not win me over. It had a perfectly caramelized thin crust that was brittle as it should be and gave way to the ginger cream / pudding underneath. 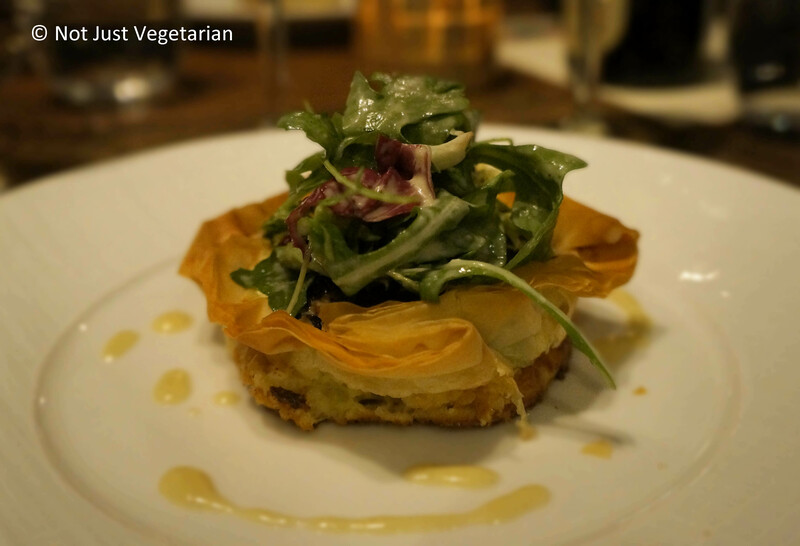 What can vegetarians eat at Jeanne & Gaston? get the Grand Marnier or the Praline souffle, the traditional apple charlotte, and try the blackberry sorbet in between lemon meringue (and make sure that I have either fasted all day, or have already spent 2000 calories to justify this indulgence on desserts). Why would you go to Jeanne & Gaston? It’s sister organization is L’Académie Culinaire de France was founded in Paris as the Universal Union for the Progress of the Culinary Arts.